I would recommend this pillow it's very nice and perfect large size since I've been using it between my knees my lower back pain has been much better. It's perfectly firm and the cover it comes in is very nice. Shipping time was pretty decent I got it in a reasonable amount of time definitely recommend this product. 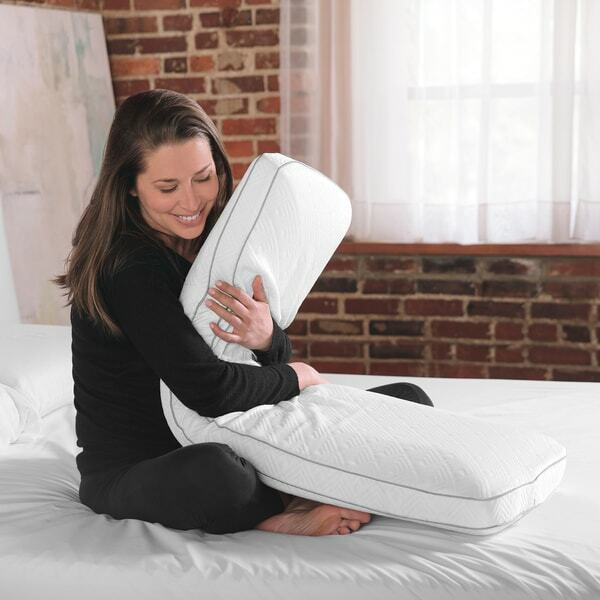 With ventilated pressure-relieving memory foam that conforms to your body, this cooling pillow will aid your sleep. Cool, gentle fabric wicks away heat from your body for continual sleep through the night. Great memory foam body pillow. I use it to prop my swollen knee up on as well and behind my other pillows so that I can recline and watch movies. It is firm just like a memory foam bed. I have used body pillows for 15 years. I am still getting used to this one, but so far I like it. I didn’t give it five stars because I do wish it was thicker. I know it warns it’s thinner but I wasn’t prepared for half the thickness of the ones I generally use. And shorter then the ones I usually buy. However, some pluses...it does keep your hips in a more natural alignment then the others it seems at this thickness. It’s definitely cooler which I will love in the summer! I’m sure I will get used to it and maybe it would have five stars later. This body pillow is so soft and cool. It is very comfortable. This body pillow did take time to get use to because it is firmer but it doesn't lose it's shape and you don't wind up getting too hot like you do with other body pillows. I really do like it. wife loves this body pillow, it's fluffy and and cool to the touch and did I mentioned soft? this was a wonderful gift,. Excellent product! I use it nightly. I have had several body pillows in the past. My favorite pillows and covers have come from Overstock.com! The cooling doesn't last long enough for me, and the pillow is very hard to fold up with arms to get around it. Other than that, I love having this pillow with me at night....when it is cool, it is so helpful! Awesome pillow my husband loves it! Even though I returned the product it was very nice and definitely cools. It matched perfectly with my mattress but it wasn't what I was looking for. Bought this for my son leaving for college in Florida. He has a bit of a pillow issue. Says this one works great and gives plenty of support for his back. i needed a body pillow and curious how good this one is. It had 5 Stars, and I just purchased a new mattress and needed new body pillows! "What size pillow case would you recommend?" The more common 21" x 54 standard size covers for body pillows work fine although they are slightly long at the ends; for a more snug, form-fitting cover try to find the 20" x 48" pillow case, but the material and color selection is more limited. "I need this as a body pillow as I have a bad leg and burning pain. I wondered if it stays cool and how hard it is?"